From the west side of Tower Bridge, George Davison Reid composed this photo looking out across the Upper Pool. This image is atypical of Reid's work, being a posed shot. The children appeared in other photos at different riverside locations. It has been suggested that some of the girls could be Reid's daughters. A night shot outside the Palace Theatre before an evening's performance. The Frankie Vaughan Season ran from 20 January to 16 February 1958 and included Vaughan as the headliner and artists such as Petula Clark, who was to sing her latest hits. 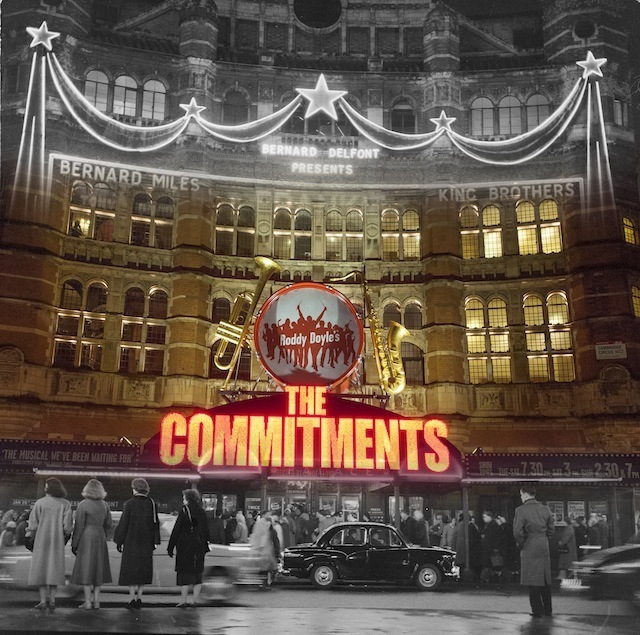 Collins created a number of night-time photographs playing with the bright lights of the West End to record people enjoying the buzz of fifties nightlife. 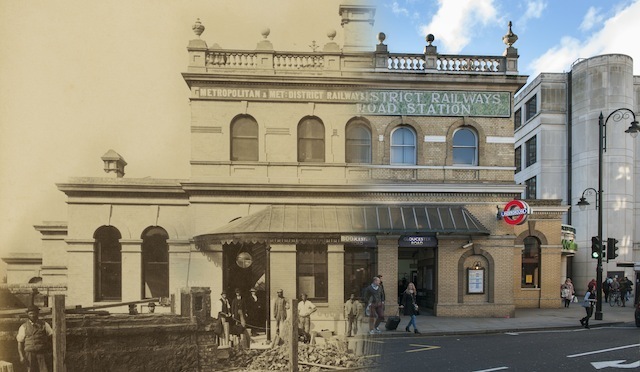 The exterior of the completed Gloucester Road Station on the underground Metropolitan and District Railway, which was opened on 3rd October 1868. From a series of 64 photographs taken in the late 1860s by Henry Flather to document the construction of the railway from Paddington to Blackfriars via Kensington, Westminster and the new Victoria Embankment. Construction was by the 'cut-and-cover' method used to build the first underground railways before the development of the tunneling shield by James Henry Greathead . The first tunneled, or 'tube', railway in London was the City & South London Line, which opened in 1890. Oxford Stree c.1903t. Horse-drawn Hansom cabs dominate the traffic. 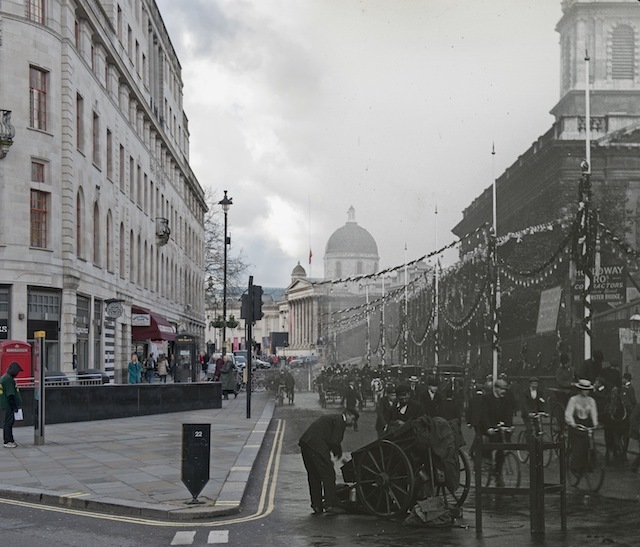 Street scene at Covent Garden with underground station and horse and cart in the background. 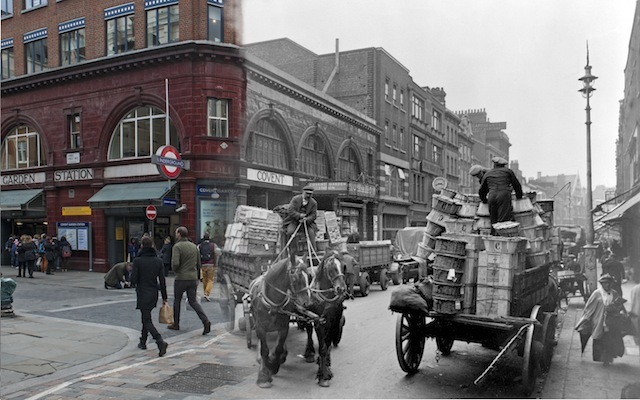 George Davison Reid photographed activity in the marketplace from opposite Covent Garden Underground station on Long Acre. A police constable was often needed to control the congestion of the horses and carts and increasing numbers of motorised vehicles. The long established market place was under pressure to move. The congested facilities were described at the time as 'altogether inadequate to the necessities of the trade'. However, the fruit and vegetable market did not relocate until 1973. 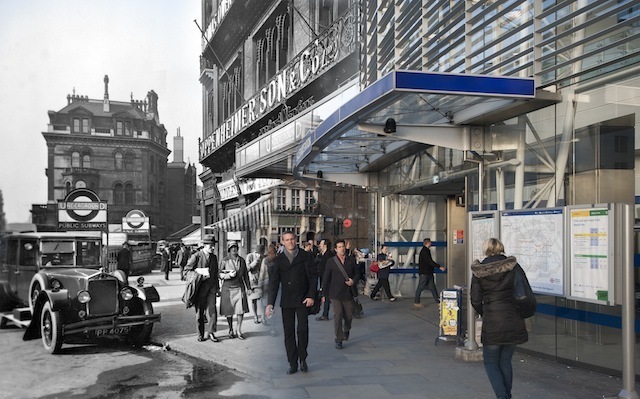 George Davison Reid took this photo of Blackfriars station entrance from outside 179 Queen Victoria Street. The station was originally called St Paul's and was opened by the London, Chatham and Dover Railway in 1886. Above the station were the premises of Oppenheimer Son and Co Limited, which manufactured pharmaceutical specialities. The Times newspaper was also based here in Queen Victoria Street. A decade or so after Reid photographed this exterior, the station was bombed in the Blitz of 1940 and largely destroyed. The offices of The Times newspaper were also hit. 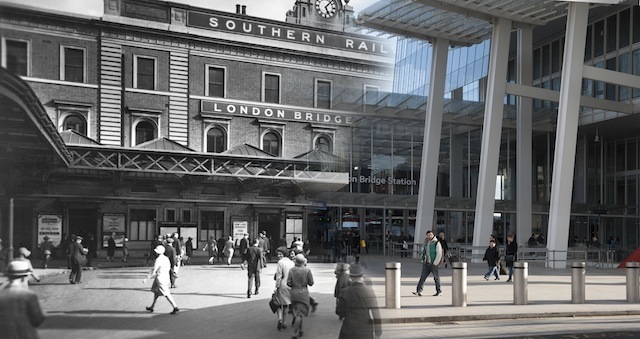 A view of the forecourt of the Southern Railway's terminus at London Bridge. 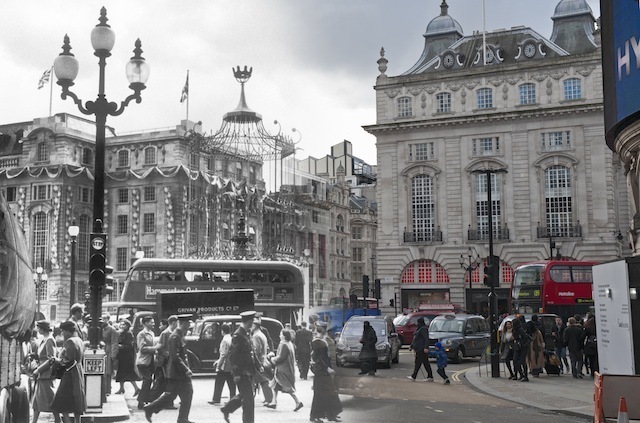 The double-decker bus on the right belongs to the London General Omnibus Company which was, in 1933, to become part of the London Transport System. Piccadilly Circus, Coronation day,June 1953. Crowds gather to witness the Coronation procession of Elizabeth II. The coronation went ahead in Westminster Abbey on 2 June 1953, and at the Queen's request, the entire ceremony was televised throughout the Commonwealth, and watched by an estimated twenty million people. 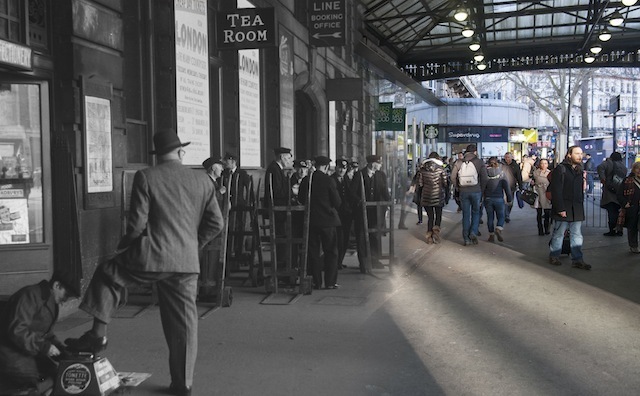 Boy shining shoes outside the Tea Room at Victoria station in 1950. A group of porters can be seen with their trolleys waiting to help travellers with their luggage. 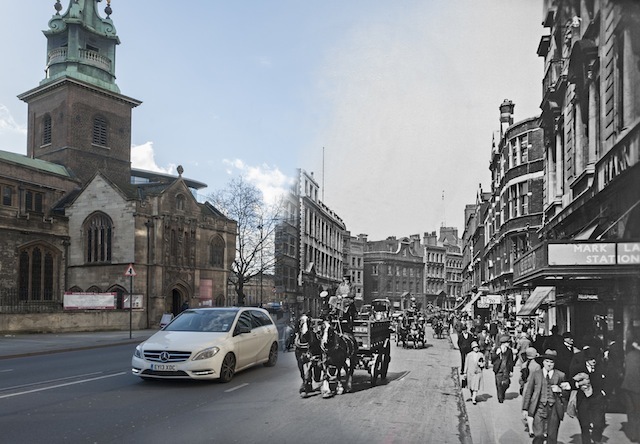 This photograph shows Byward Street near Tower Hill, looking west with the church of All Hallows by the tower on the left and the former Mark Lane Underground station on the right. Reid photographed the streets and buildings of London and the activity in them in the 1920s and 1930s. 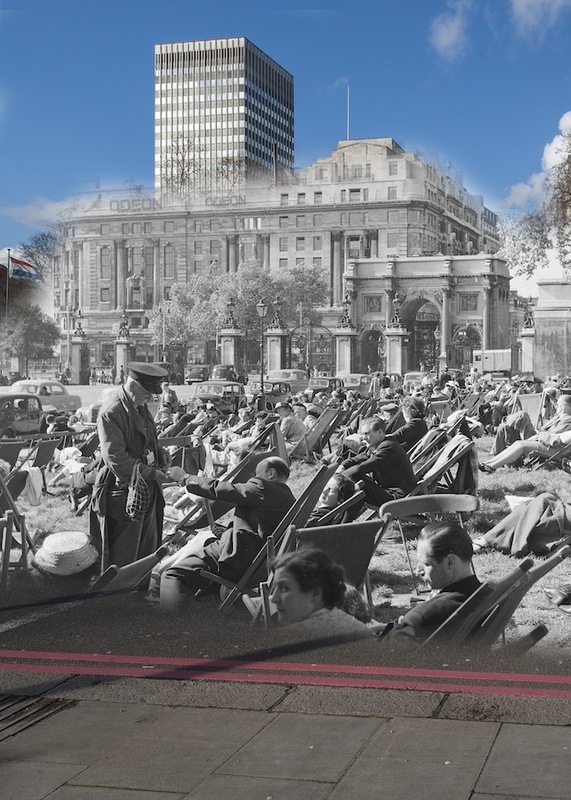 People sunbathing in Hyde Park with Marble Arch and the Odeon cinema in the background. The attendant is selling tickets for the deckchairs which are available for hire in the park. The Odeon which was originally a ‘Regal’ cinema, opened in 1928. The façade of the building was made from Portland Stone and featured columns and statues however in 1964 it was thought too small and the building was demolished and a larger cinema complex was built in its place. The Museum of London's Street Museum app has always been among our favourites. 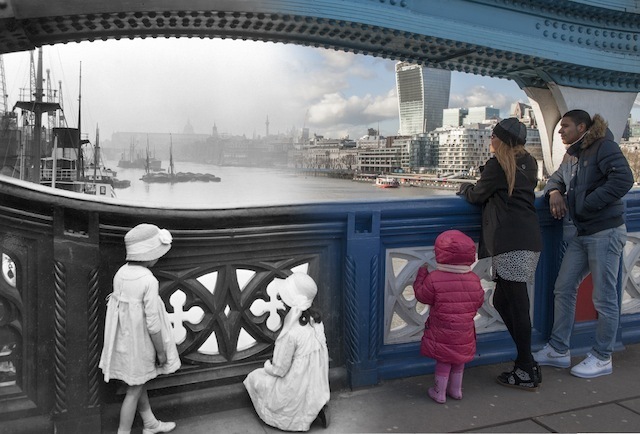 It uses augmented reality to overlay old photos of London over your phone's camera view. It's just been re-released with 103 new locations and improved functionality, and lets you order prints of favourite images. 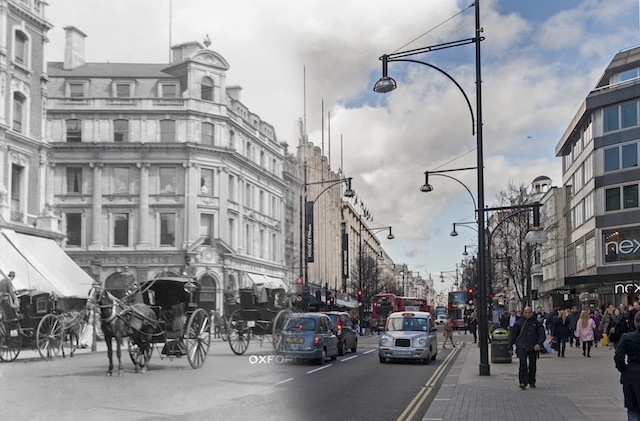 To give you a taster, the museum has worked on these stunning images of old and modern London combined. This mixing of eras is something of a trend at the moment, but the Museum's efforts are the best we've seen. Street Museum 2 is available for Android and iPhone, and is totally free.